animation time offset on crows. Animations should be running at different tempi. cooldown on bullet time effect availability (bullet time upon shooting the grand clock). 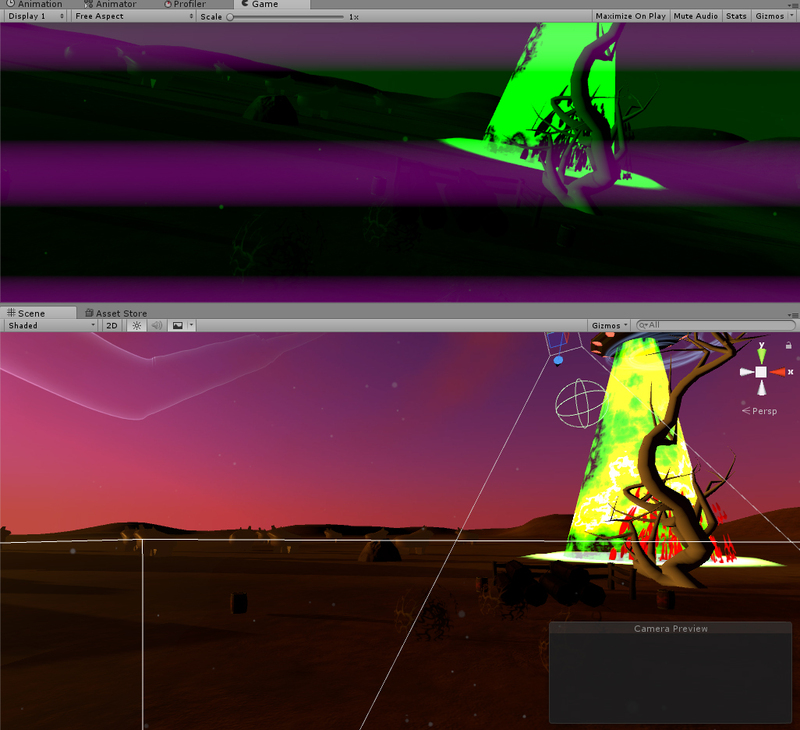 implemented a visual impairment on the player when one of the precious cows are abducted. Losing a cow will no longer go unpunished! 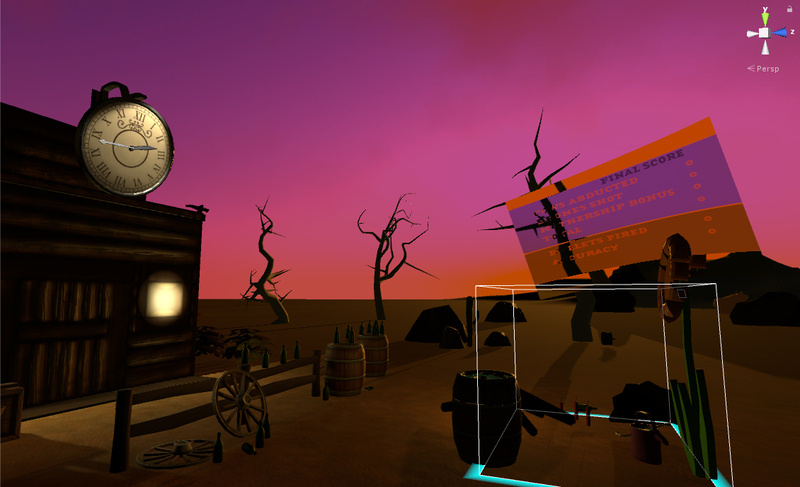 rendering of ui now set to secondary camera forwarding what it sees to a texture on a warped canvas near the player. drones are now dramatically crashing into the ground. level number displaying in the first few seconds of a newly started level. accuracy tracking and display on UI. made the serialization code for saving player data. advancing to next level involves the enemy ai getting better and faster and learning how to best defeat you. gun failure system implemented. Guns are now randomly failing. clock now makes a sound when it is ready to activate bullet time. AI stats are now resetting on level 1. The game was getting quite difficult to test, as the AIs were becoming extremely efficient. built a machine that let’s you start the level. Pretty useful. built a selector system for signs/icons. drones are now in earthly camo. Pretending to come in peace. objects no longer disappears on next wave. player can now lose the game. Player still can’t lose! That might make it too easy. installing a shower cabin in the game for watering the magic plant. shotgun weapon heat capacity increased. bowling ball drag effect adjusted. Weapon failure system tuned. Visual effect now more present. Steel pot 3d model and textures redone. Shotgun / Winchester / Whatever-Rifle now has more weapon power. Double the amount of bullets with double the amount of damage. Weapon failure rate increased. Heat capacity raised. Drone DNA is now stored completely for each play cycle. No more deleting the lists between cycles. Dynamite fuse fire now moves down the length of the fuse, to show pyer how much time is left before it blows. Weapons and items are now persistent. Grabbed items are still freaky. Bullet now has ricochet effect with sound. Bowling ball weight and drag adjusted. items “Pistol” and “Gun”: damage, heat cap, and failure rate adjusted. Clock moved to match position of wall. Health bottle size increased and positioned in front of player. Weapon cooling: when weapon is cooled completely it makes a reloading sound. End of Level: weapons are now dropped from controller grab. Controllers no longer invisible after weapon mafunction causes disintegration of grabbed weapon. Umbrellas now come in different colors. Important stuff. Level Reset and Level Initiation system redone. New colors for drone headlights. Drones now have an extra detection system for checking if player is in sight. Mothership vulnerable visual effect reworked. Menu scene: specific system for guns in that scene. Menu scene: target practise field. Menu scene: Title and animation of light. 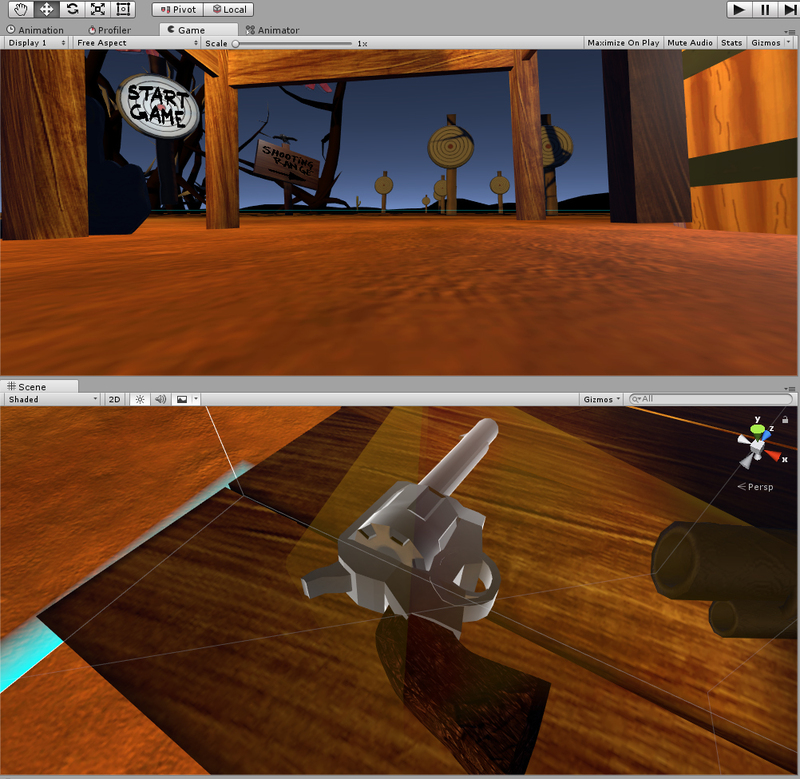 Menu scene: target practise button to start game. Menu scene: soundtrack set to main theme. Added “Finger on a pole”. For making drones angry. Bullet cases now makes a sound when they hit / bounce on the ground. 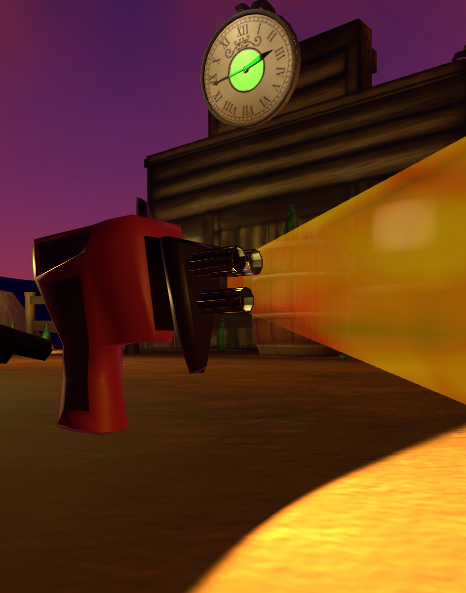 New ridiculously overpowered gun, that most likely will do as much damage to yourself as to the enemy.